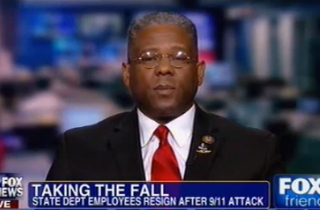 Appearing on Fox & Friends this morning, outgoing Rep. Allen West (R-FL) snarked that Secretary of State Hillary Clinton seems to have caught “Benghazi flu” on the day she was originally scheduled to testify before Congress about the deadly terrorist attacks on the U.S. consulate in Benghazi. Clinton’s office previously announced she would miss her originally scheduled testimony due to fainting and suffering a concussion. West is one of many conservative figures who have publicly doubted the severity of Clinton’s injuries, snarking that she is conveniently missing her scheduled testimony for an untreated concussion.